I am not a shy girl, and I politely say, “But the Chocolate Haupia pie is memorable, beyond delicious, you won’t be sorry. ” Squinting her eyes a bit, she repeated her claim about the Kauai blue book guide and again told the cashier about the apple bar’s claim to fame. The cashier shrugged her shoulders and said, “We’ve evolved since that was printed…she’s right…we sell out of the pie daily.” I smiled, quite smugly. So what is Haupia, if you don’t already know? 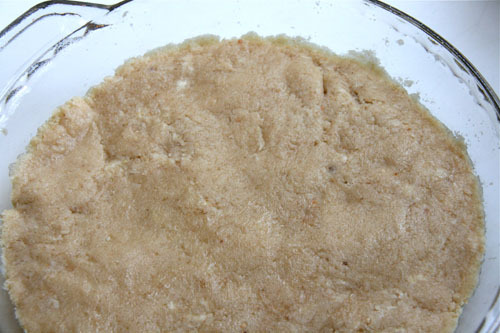 Haupia is a traditional coconut milk-based Hawaiian dessert often found at luaus. It is oven served in little squares, and to me, it tastes like a cross between jello and pudding, however not as sweet as either. By itself it is fine, if you ask me, but nothing to write home about; But in this pie, it is quite a star. This pie has everything you crave in a dessert and then some. It starts with a macadamia shorbread crust (oh. my.) that could easily stand alone as the best cookie ever, and then has a layer of Haupia, a layer of chocolate Haupia and finally is crowned with freshly made whipped cream, curls of crisp coconut, chopped macadamia nuts and grated bittersweet chocolate. This pie is dangerous, creamy, crunchy and incredible and I have replicated it to perfection. So humble, I am aware. Humble AND outspoken. I am quite the catch, aren’t I? But I bake like nobody’s business, and I am sure that this is part of the glue that holds my twenty year marriage together. Glue made of sugar, flour and vanilla (I am Not a gluten free girl either, we all have our hang-ups). Anyhow, if you need some sweet, coconutty and chocolate love to add to your life, make this pie, and then feel free to shout swear words at the air, because then you will be addicted, like me, and I will officially be your Haupia Pie pusher. It’s a title I will just have to live with. Add the cold, chopped butter a little at a time and pulse each time until the butter is incorporated. Add the milk and vanilla and pulse again. Your mixture will come together. See? Press the mixture into your pie pan. 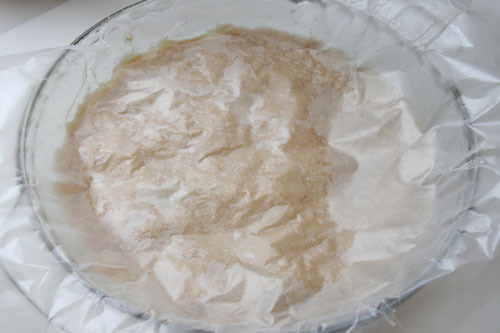 Then get a sheet of wax paper and press down on the crust all around the bottom of the pan, pressing the crust flat and even. The original recipe suggests you refrigerate the crust for an hour before baking. I did not and it was fine, but I had one reader who ended up with a crumbly crust that was hard to serve so you may want to follow the original recipe advice and refrigerate before baking. 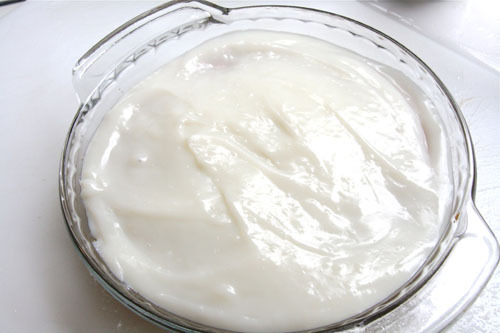 For the filling: In a medium sauce pan, place your coconut milk, milk and sugar and whisk together. In a separate bowl, whisk together the cornstarch and water, gradually adding water the cornstarch until smooth and set aside. Turn your burner on medium and stir the milk mixture constantly, scraping the bottom so no hard bits form. After it comes to a boil, turn it down to a simmer and SLOWLY pour in your cornstarch mixture, stirring or whisking constantly. I like to whisk so there are no lumps. Cook and simmer for three minutes or so or until the mixture is nice and thick. For the whipped cream: Whip the heavy cream in a stand mixer fitted with the balloon whisk attachment. Beat on medium at first and slowly work up to high until soft peaks form. 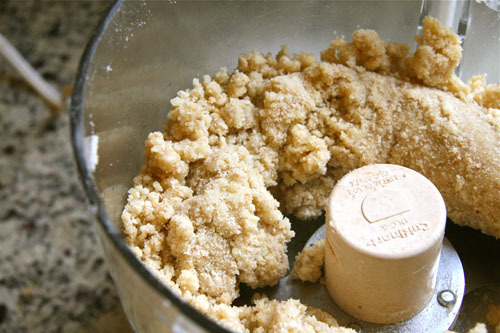 Add your sugar, one tablespoon at a time and continue to beat on high until stiff peaks form. Either spread the whipped cream over the top of the pie or pipe it on with a pastry bag and LARGE star tip. Learn something new everyday! This looks terrific! This recipe sounds amazing, love the toasted nuts. But what really made my day was the thought of you telling another lady she was ordering the wrong thing. Why don’t people listen to us foodies more! We’re always right. You probably think I’m joking, I’m so not. Welcome back, Geni!!! I just downed a handful of macadamia nuts before I read this post….that’s kismet, if you ask me.. 🙂 Hope you had a wonderful trip…this looks fabulous! Oh, I would pick that any day of the week. 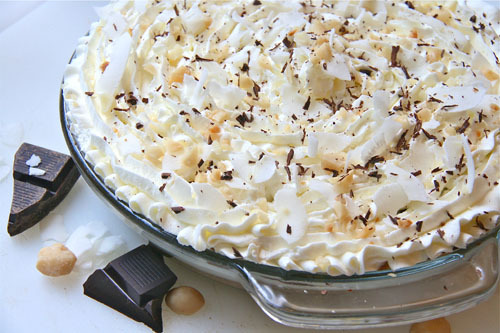 Coconut and chocolate in a creamy pie?! What more can you ask for. Lets see, what can I say here… Decadently delicious. Your pie looks beautiful! I”ve never heard of haupia before…may have to try this next winter (I’m hoping to make it to Kauai.). 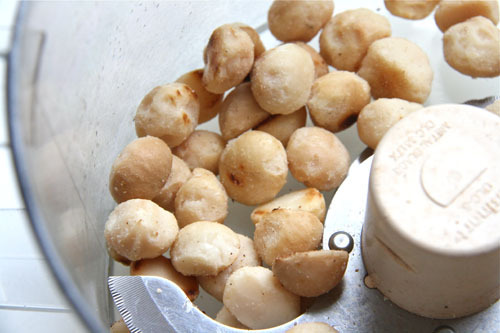 In the meantime, I may have to try this macadamia shortbread crust. It sounds delicious! Amazing looking pie! I’m always one to follow the recommendations of a local foodie over a guide book. Great post! Wow macadamia, you got me there. I love any cake with macadamias on it specially white chocolate macadamia cakes. But looking at the photo above this would easily be my favorite as well. I really cant keep my eyes on that photo, it looks so divine! Sometimes rudeness is the only way to get through to people. That’s my story and I’m sticking to it. this pie looks fantastic! I love coconutty desserts…add some chocolate and I love even more! First of all – how awesome is it being right like that? I would TOTALLY have trusted you if you told me to try something at a bakery. Love that you weren’t afraid to voice your opinion, and well, the truth! I’m sure I would have done the same. This pie sounds delectable. I especially love the use of macadamia nuts for the crust. :-)) You make me smile, gal. The pie looks terrific and it looks elegant! I love the macadamia in the crust. OOOH MY! Can I PLEASE have a piece! You need to sell this so I can buy it!!! ZOMG the ultimate pie is standing before me on my screen! Coconut, chocolate, cookies, AND a jello-pudding texture??!! PURE HEAVEN! Yes. Just let me know when you’re coming…don’t you live close by? Relatively speaking. Oh man, I love anything coconut- how did you know that? I have to try this asap for myself & hubby! Thanks for reminding me that I bought a macadamia packet 2 months back & its resting in the freezer since then 🙂 It has to be put to work now. wow…wat a wonderful selection of recipe…absolutely delicious.. Thanks for subscribing! Your website isn’t linked to your name so let me know how I can find your blog. How unique and delicious looking! Thanks for sharing! Hope you’re enjoying your Hawaiian vaycay! You go girl!!!! Hope you guys had a wonderful time!!! I love apples but you sold me. I will take a piece of the haupia pie. Oh my this looks delightful. I was given a piece of ‘haupia pie’ before. He told be he substituted this for that, and that for this. By the time he was done it tasted like a really bad coconut cream pie. This looks soooo good. I am a huge macadamia nut fan and can’t wait to try this. Wow! This is excellent! My husband and I spent a week in Kauai last November. We kept returning to the Village Bake Shop to get yet, just one last piece of that incredibly delicious Haupia pie. We bought a bag of Haupia at Costco and took it home with us, just fascinated with this cocunutty dessert. I am looking at the bag thinking, OK, now how did they make that pie? Well, look, low and behold, you have amazingly presented us with the recipe for this wonderful treat!! Thank you, Thank you, Thank you!!! I bought the bag mix as well and will try that too. But I wasn’t sure if anyone on the mainland would be able to get the mix packet. Anyhow, so glad to have helped and hope you have great success. Let me know how it goes. I still dream about that pie! I came across this forum because I was looking for the name of a traditional Hawaiian dessert to try while I ame there in March/April, thank you Liz for suggesting the Village Bake Shop I will make sure I visit there. If anyone else can recommend where to get a fabulous specimen of this pie please let me know. Hanalei is a great little town! I would suggest you also try the shave ice while there – get the traditional mix with macadamian nut ice cream. I think the Wishing well is probabaly the best!! Enjoy!! have a coconut cream pie that is close to the infamous village bakery one? dying to have one like it here in cali. Let me know how it goes for you. I was very happy with the results. I am in So. Cal! I can’t wait to try this. We get the Haupia Pie each time we’re in Kauai at the same shop! It’s delicious!!! I can’t wait to try this recipe! 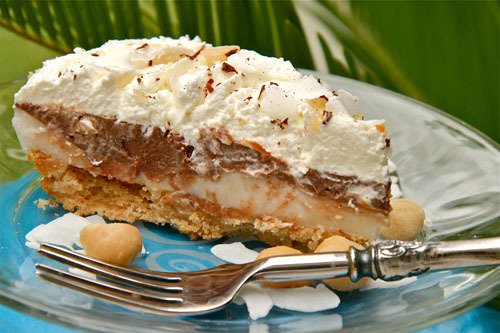 We have the Haupia Pie each time we’re in Kauai and this will be a great “Kauai” fix when we’re home! I made this and was sooo excited for it. When I cut into the pie, the crust was totally not cooperating with me…leaving me very sad. It was very hard and difficult to cut, maybe my slab of pie look very ugly and disassembled on my small plate. Any pointers? Did you use rice flour? I do think that would make a difference. Also, I went back to the original recipe and it asks you to refrigerate the crust for an hour before baking. I will add that to my instructions although I did not do this for my pie and it was fine. Finally, I am wondering if you refrigerated the pie for enough time before serving? I will try to make it again soon and see if I can trouble shoot your question. Thank you for your feedback.